Gambling addiction is a very serious condition that can destroy lives. Although treating a gambling addiction can be challenging, many people suffering from the disease have found help through professional treatment. It is estimated that around two million people in the U.S. are addicted to gambling, and that for as many as 20 million the habit seriously interferes with work and social life. Gambling addiction is defined as a persistent and recurrent problematic gambling behavior that leads to clinically significant impairment or distress. There are many factors that can contribute to the development of a gambling addiction, including: desperation for money, the “high” that comes from the thrill of betting, and the intoxicating atmosphere of the gambling scene. In the past, the psychiatric community generally regarded gambling as a compulsion rather than an addiction, i.e. a behavior primarily motivated by an intense urge rather than physical necessity. However, as studies revealed that gambling addiction is far more similar to alcoholism and drug addiction than originally thought, the American Psychiatric Association made the decision to officially recognize gambling as an addiction in the 5th edition of the Diagnostic and Statistical Manual of Mental Disorders (DSM) in 2013. Similar to methamphetamine, cocaine, and other addictive drugs, gambling addiction is associated with release of dopamine within the brain. Addictive substances affect the brain’s reward system and release up to 10 times the normal amount of dopamine. Continuous use then causes the body to develop a tolerance, as natural production of dopamine is inhibited and the body needs more and more of the stimulating substance in order to receive the same rush. Without a doubt, we know it’s an actual brain disease. That’s very different from 20 years ago when people saw it as an issue of morality, creed, and lack of willpower. There are brain changes that explain why people can’t stop. Just as those suffering from substance use disorders require increasingly strong hits to get high or increasingly larger amounts of alcohol to get drunk, gambling addicts pursue riskier ventures and bet increasingly larger amounts of money to receive the same pleasure they once did. Additionally, research shows that pathological gamblers and drug users share many of the same genetic predispositions for impulsivity and reward seeking. Furthermore, both those suffering from substance abuse problems and compulsive gamblers endure symptoms of withdrawal when attempting to quit. The defining element of a gambling addiction is that people become completely absorbed in specific gambling activities and then pursue them in a compulsive manner, despite the potential negative consequences. Those suffering from a gambling addiction often describe a sense of loss of control in which they believe they are incapable of avoiding or stopping gambling. Unlike causal gamblers, people addicted to gambling cannot simply stop when losing or set a loss limit; they are compelled to keep playing to try to recover their money. The person loses more than intended, feels bad about the amount of money lost, and then tries to recoup the losses by gambling even more, which consequently leads to even more money lost. This destructive cycle leads to many negative consequences and can have a serious impact on an individual’s physical, emotional, and financial health. Don’t waste another second. Call immediately to speak with a compassionate treatment expert. One of the most debilitating effects of a gambling addiction is the massive debt that accumulates over time; the average debt that a gambling addict owes is anywhere between $40,000 and $70,000. It is not uncommon for those with a gambling addiction to lose their jobs as they often miss work or neglect duties to be able to gamble. 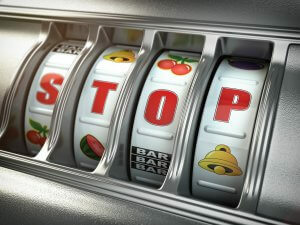 Many problem gamblers will then often resort to illegal activities, such as theft or fraud, to fund their addiction. Those who are unable to pay off their debts are forced to declare bankruptcy and may even lose their homes. I could not lose money fast enough. Within six months of my intense gambling, I had lost hundreds of thousands of dollars. I went through my home equity line, all of the credit I could get from credit cards, and borrowed money from anyone who would give it to me. Money was my drug, and since gambling was how I got high, I would get it anyway I could. This kind of financial stress puts a huge burden on both the family and the individual. Many family relationships break down as a result of problem gambling, and children are often the innocent victims of the emotional distress created within the home. Those suffering from a gambling addiction additionally endure physical health issues such as ulcers, stomach problems, headaches, and insomnia due to stress. People with problematic gambling issues are also more likely to abuse drugs and alcohol, which can lead to further devastating effects. Similar to other behavioral addictions, therapists have found that compulsive gamblers respond positively to pharmacological and psychosocial treatment. Opioid antagonists, such as naltrexone, are commonly used to help reduce cravings for the activity and increase impulse control. Cognitive behavioral therapy has shown to be particularly effective in addressing gambling addictions, as it teaches resisting and changing habits, as well as identifying the underlying cause of addiction. Additionally, support groups and 12-step programs, like Gamblers Anonymous, are helpful as they offer judgment-free support for fellow recovering gambling addicts. If you believe that you or a loved one may have a gambling addiction, it may be time to seek professional help. There’s no reason to spend another day struggling with addiction. There are countless treatment facilities out there equipped to specifically help with gambling addictions. Contact a dedicated treatment specialist today to learn more about your options.